Controls for Large Scale Chillers. Controls for Retail Store Utility Management. 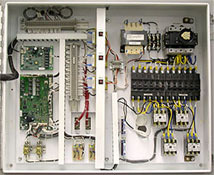 Controls for High voltage regulations. Document fully from schematic or specifications, layout for low cost, ease of assembly, critical usage factors, bill of material creation, assembly drawing via AutoCAD, cabling optimization UL optimization and turnkey support. Automated supply chain management, assembly of large, highly complex panels with feature/model variability. Continuity and simulated functional testing. UL management.